This is a high quality map of mainland Britain that shows the huge extent of canoeing possibilities on rivers, lakes, canals and coast. It is colour coded to clearly show the nature of these waterways. Southern England and Wales appears on one side of the B1 sheet – Scotland and the North of England appears on the reverse. Tidal rivers and different Grades of river – Flat, classes: 1, 2, 3, 4. Navigations (e.g. canals) used by motorized craft. Selected coastal paddles are marked, as are artificial white water courses. This map projects the ‘Big Picture’ and is very much a product that inspires, excites and gets people planning and dreaming of their next canoe trip. Some paddlers will buy this map for the office wall whilst for the newcomer to the sport it answers the question “where can I go paddling next? Information panels give helpful information on access, recommended websites and guidebooks – designed to ‘open the doors’ to the world of canoeing and kayaking. So where should you paddle your canoe? Although the list of canoeing possibilities is almost endless, the following are some of our favourites. 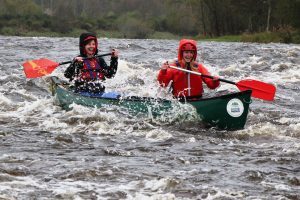 You could also have a look at the Scottish Canoe Routes website for inspiration, which is designed to give the newcomer a taste of what you can do in Scotland. The route from Fort William in the west to Inverness in the east is known as the Great Glen Canoe Trail and encompasses the Caledonian Canal plus 3 beautiful lochs, including the awesome Loch Ness. The series of canals, rivers and lochs allow a canoeist to paddle some 60 miles through stunning highland scenery. It generally takes between 3 and 5 days to cover the whole route depending on the size of the group, weather, fitness levels and experience. It also depends on how much you want to enjoy the surroundings and Highland hospitality as you go, or to race to the finish. If you don’t feel you have the experience or time to organise your own trip, why not join one of our guided Great Glen expeditions. 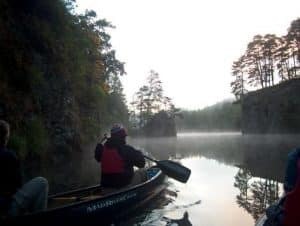 A wilderness canoe adventure – Take 3 days for this true wilderness trip with no real paddling difficulties although there are a couple of difficult portages and great views of Suilven along the way. A wild camping heaven. Get in touch for more information about this trip. A great short film in the wonderful Inverpolly area – hard work but rewarding! This route takes you into the wilderness with lots of small lochs and low hills west of Loch Assynt. 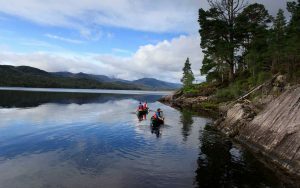 It’s a great opportunity to link around 10 lochs by portages and by walking your canoe along the various connecting watercourses. You’ll need to be totally self-sufficient on a trip like this but this is another wild option for those with a sense of adventure. Starting at Inchnadamph you’ll paddle across Loch Assynt, through Gleannan Salach to Loch Poll and eventually to the sea at Clashnessie. Glen Affric is worth a visit in its own right, a glen which is being replanted by ‘Trees for Scotland’, also offers 2 lochs set in beautiful scenery. Wild camping galore, wildlife, mountains, peace and quiet…what else can we say? A virtually ignored gem of a paddle from the Affric foothills, through lofty cliff amphitheatres with mixed woodland, forest and grassy farmland flats. This is Chisholm country, with the Clan seat at Cromar, near the start of the paddle. The area is well known for its wildlife with the opportunity to see eagles, otters, mink and pine martens. Moving water experience is required for this trip with Grade 1 and 2 rapids along the way. Why not join one of our Dawn Canoe trips in the Aigas Gorge? Canoe expedition clients arrive at our equipment depot near Inverness at 8.30am (free secure parking for the duration of your trip). Clients using public transport can be collected from Inverness at 9.00am. Drop-off at Banavie (at the start of the Great Glen Canoe Trail paddle) for people and boats would be around 11.00am. The objective for Day 1 would then be to reach the Glas-dhoire wild campsite or South Laggan that night. Paddle from South Laggan to somewhere near the bottom end of Loch Ness. Wild camp. Paddle to Dores at the north end of Loch Ness or camp close to Inverness. Transfer from Inverness to the River Spey (early in day if progress has been good in the Great Glen, perhaps later in the day if delayed by weather). 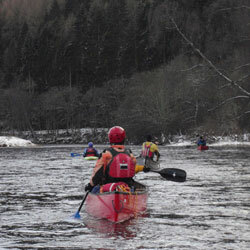 Drop-off on River Spey would be dependent on the time available but could be Kincraig, Aviemore or somewhere else. We would normally suggest a start point of Aviemore, the aim being to reach Boat of Balliefurth to camp for the night. Paddle from Boat of Balliefurth to Ballindalloch Station (nr. Cragganmore). Paddle from Ballindalloch to Craigellachie. Paddle from Craigellachie to Spey Bay for a 2.30pm pick-up. Transfer back to Inverness for 4.30pm or back to our depot for 5.00pm. Please note: Paddling the Great Glen in 3 to 3.5 days is hard work, so you would have to be reasonably fit, have canoeing experience and take the River Oich short-cut (this means that someone in the party must be competent at rescues on moving water – which you would need for the Spey anyway). We would strongly recommend that this challenge is attempted by paddling tandem too! Another one of the ‘Big 4’. You can potentially start at Loch Tay and make your way all the way to the coast at Dundee. However, along the way are some large rapids so these would have to be portaged around if using our hire equipment (as we don’t allow our kit on Grade 3+ water). However, there are plenty of more sedate options to consider on this historic river. These are just some of our favourites but there are endless other places to paddle. Why not give us a call for other ideas? Alternatively, there a couple of good books that we recommend: ‘Scottish Canoe Classics‘ by Eddie Palmer (Pesda Press) and ‘Scottish Canoe Touring’ – a Scottish Canoe Association Canoe and Kayak guide, also published by Pesda Press. Check out this great short film from one of our River Tay hire bookings – great to watch! The Dee is another major river, eventually ending up in Aberdeen, having risen in the mighty Cairngorms. It does however, carry the least water of Scotland’s main rivers. Caught in Spring or Autumn after some rain, it makes for a delightful river trip of 3 or 4 days in a generally little-populated valley that is also home to Royal Deeside and Balmoral Castle. With conveniently placed campsites at Ballater and Banchory, a 3 day trips fits in really nicely, but you can also wild-camp in many places, and perhaps take 4 days to complete the route from Braemar. Definitely worth considering although you will encounter a number of technical rapids to negotiate, not for the inexperienced. The Tweed is one of Scotland’s major rivers running through the Borders, rising in the extreme south-west corner of the Borders. However, it is generally only paddled from Peebles or further downstream. It has many historic associations, with castles and great houses along its course. The upper valley is beautiful and wooded and the lower sections, flatter and more agricultural in nature. It’s 110km from the lovely town of Peebles down to its coastal outlet in Berwick, offering a trip of 3 or 4 days. The Clyde is not paddled as often as many of our other rivers, mainly because in drier weather it doesn’t retain as much water. However, as long as you don’t plan to paddle it around the time of a prolonged dry spell, then this would be a great option to consider. The landscape is open and surrounded by grassy countryside, with wide open stretches. The valley also has a beautiful Scottish Wildlife Trust Nature Reserve with badgers and Peregrine Falcons to its name. You will find whitewater kayakers in the gorge near Lanark, but there are few other obstacles along the way to deter canoeists. It also benefits from easy road access at many points along it’s way. Follow 40km of fully navigable waterway on the Forth and Clyde Canal from Spiers Wharf in central Glasgow, over aqueducts, through tunnels and tranquil scenery until you link with the Union Canal at the Falkirk Wheel. It’s then 50km along the Union Canal from to the Lochrin Basin in the heart of the capital. The route reopened in 2002 after the largest canal refurbishment project ever undertaken in the UK. It has spectacular aqueducts, the river valleys of the Almond and Avon, through the middle of historic Linlithgow, goes under the Roman Antonine Wall and has wonderful high level views to the north over the Wheel basin. Suitable for canoes and kayaks.